I just finished watching this movie with my husband and I was blown away. It is based upon the same-title novel written by Francine Rivers. The story evolves around a 19th century celtic ritual. When someone dies, a man called the Sin Eater eats some food which has been placed upon the body, thus eating the sins of that person. In this way the Sin Eater absolves the dead person of their sins. The story begins with a little girl losing her grandmother. 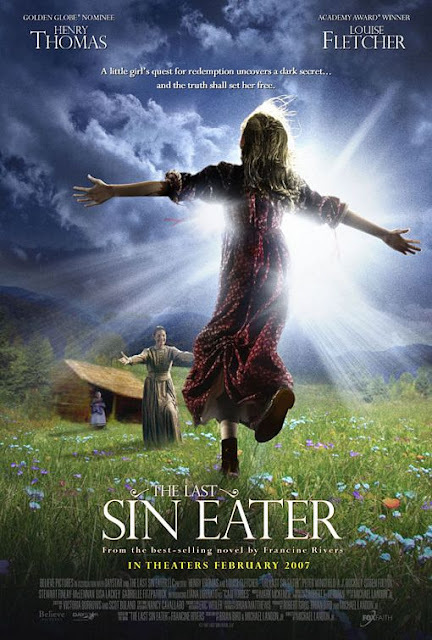 When she watches the Sin Eater eat her granny's sins, she decides that's what she needs herself, since she has comitted many unforgivable sins. No one in the small mountain village, least of all herself, expects the consequences of the little girl's quest for the Sin Eater, or the transformation it will bring about. This movie is deeply honest and spiritual. It deals with the subject of truth and lies. It is also about sins deep and well-concealed within our hearts and our past and ultimately, it is about forgiveness and redemption. I especially loved the fact that they call Jesus "the original Sin Eater", I had never thought of Him this way before, and it touched me deeply. It is one of the best and most profoundly christian movies I've ever come accross.